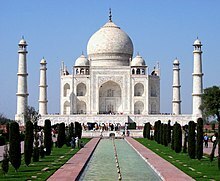 Mumtaz Mahal was born in April 1593 in Agra, India. Her father was the Persian noble Abdul Hasan Asaf Khan, the brother of Nur Jahan, the Mughal Empress wife of Jahangir. Mumtaz betrothed (nikah) with shah jahan at the age of 14 in 1607 when Shah Jahan was 15 , Shah Jahan, later married two other women.May 10, 1612 at the age of 19 the official marriage ceremony was held. Shah Jahan and Mumtaz Mahal were married for 19 years. They had thirteen children together. 7 of the children died at birth or at a very young age. Mumtaz travelled with Shah Jahan and his army as he carried out military campaigns. Mumtaz Mahal supported Shah Jahan and they respected each other very much. Mumtaz Mahal died on June 17, 1631 in Burhanpur in the Deccan (now in Madhya Pradesh) during the birth of their fourteenth child, a daughter named Gauhara Begum. She had been with her husband as he was fighting a campaign in the Deccan Plateau. Her body was kept at Burhanpur in a walled pleasure garden known as Zainabad. A popular story says that on her deathbed, her last wish to the emperor was for a symbol or a monument to their love. She also asked her husband not to marry anyone else. The emperor promised immediately. Her body was buried in the Taj Mahal in Agra. It is also belived that Mumtaz Mahal died, aged 40, while giving birth to Gauhara Begum in Burhanpur, the cause of death being Postpartum hemorrhage, which caused considerable blood-loss after a painful labour of thirty hours. Contemporary historians note that Princess Jahanara, aged 17, was so distressed by her mother's pain that she started distributing gems to the poor, hoping for divine intervention and Shah Jahan, himself, was noted as being "paralysed by grief" and weeping fits. After she died, Shah Jahan went into mourning for 2 years. When he appeared again, his hair had turned white, his back was bent, and his face worn. Jahan's eldest daughter, Jahanara Begum, slowly brought him out of mourning and took the place of Mumtaz at court. This page was last changed on 24 June 2018, at 08:09.